One great way to get kids engaged in the Bible is by introducing them to some of the significant people who lived during that time. 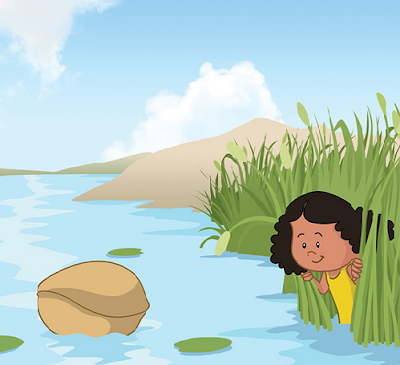 Children love hearing about heroes and their fearless tales, and there are plenty of them to talk about in the Bible. That's what I love about the Little Bible Heroes series, since they take important individuals from Biblical history and include them in books that will appeal to young children. Just recently we received the Miriam/Daniel Flip-Over Book, our very first one from the series. What could be better than a great hero story? TWO great hero stories! And there’s no better place to find them than the Bible. Each Little Bible Heroes™ Flip-Over Book offers two stories of bravery, faithfulness, and kindness—straight from the Bible and perfect for little hero-loving hearts! In these pages, read how Miriam’s bravery helped save her brother. Then flip the book over and learn about Daniel’s faithfulness in the lions’ den. Two great stories to learn from and enjoy! Victoria Kovacs is a scriptwriter, ghostwriter, author of twenty-eight children’s books, and editor of numerous memoirs, devotionals, guides, and children’s stories. Her web site is victoriakovacsauthor.com. Lately, it seems like no matter where I turn, I've been coming across these new children's books that flip over to reveal either an alternate side of the story or a completely different story in general. The Miriam/Daniel Flip-Over Book is also one of these books. It actually includes two different stories all packed into one physical book. On one side you can read about Miriam, and then flip it over to reveal an alternate story about Daniel. Since both stories are part of the Little Bible Heroes series, children will get to read about each character's special moment of bravery and faithfulness to God. Miriam was the courageous older sister of Moses. After the evil Pharaoh ordered the death of all Hebrew baby boys, she saw to it that Moses was kept safe and protected. Daniel was a prophet and loyal servant of God. His faith never wavered, even in the presence of cynics and temptation. While this may be our first introduction to the Little Bible Heroes series, there are actually quite a number of these children's books already released. 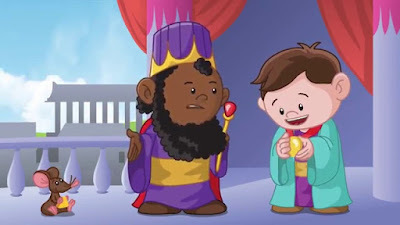 I really enjoy how this series takes some of the most noteworthy people in the Bible to create short and sweet stories that kids will really enjoy. In fact, now that I've gotten a look at this book, I will definitely consider purchasing more of the collection for my son. 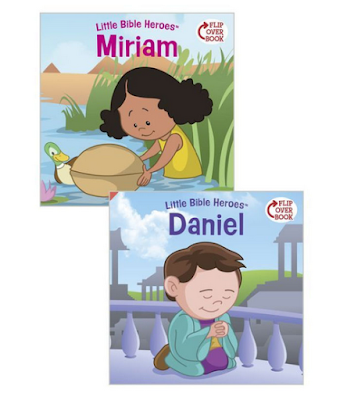 If you're looking for a neat way to introduce important Bible characters to your children, then I highly recommend giving this Little Bible Heroes: Miriam/Daniel Flip-Over Book and some of the others in the series a try.